News this week that Bank Indonesia will prohibit foreign currencies from being used in domestic transactions in Indonesia further added to analysts’ and investors’ concerns about the country’s fragile economy, and about the economic strategy of President Joko Widodo. As the Wall Street Journal reported, the law prohibiting the use of foreign currency in settling domestic transactions was actually passed years ago, but like many Indonesian laws it was not put into practice for years—until now. The volume of transactions in Indonesia conducted in foreign currency is substantial—the Journal reports that “transactions within the country in currencies other than rupiah amount to $73 billion a year,” in a country with a GDP of around $900 billion. Many transactions are conducted in foreign currencies because companies—particularly large investors in Indonesia in mining and other resources sectors—do not want to hold large sums of rupiah, which has been a volatile currency since the late 1990s Asian financial crisis. Instead, they want to conduct transactions in U.S. dollars, euros, yen, or (in some cases), renminbi. The value of the rupiah fell, this past spring, to its lowest against the U.S. dollar since the 1990s Asian financial crisis; Indonesia’s central bank clearly hopes that this new regulation will help stem the rupiah’s slide. Whether or not this measure works to stem the rupiah’s weakness, it could add to concerns that Indonesian leaders do not have a clear direction for economic policy. Some companies clearly are annoyed at having to work with these new regulations, which will require them taking more risk in the financial transactions, though the new rules are unlikely to lead any large investors to leave the country. But the law further muddles Jokowi’s policy direction. President Jokowi has offered a vision of upgrading Indonesia’s physical infrastructure—its roads, ports, power plants, and other critical infrastructure—and of attracting foreign investment commensurate with the size of Indonesia’s consumer market and the size of its workforce. However, under Jokowi growth has faltered and the much-needed investment has not yet materialized. In the first quarter of the year, Indonesia’s growth slipped to its slowest rate in six years. Consumer spending appears to be slowing as well, probably in response to a weaker economy and a weakening job market. As decisive as Jokowi often seemed as mayor of Jakarta, he and his administration have repeatedly seemed indecisive since he became president, and on economic issues his policy direction has fluctuated the most. Forcing companies to use only rupiah may be a necessary move, but it comes in the wake of other measures that have not exactly been welcoming to investors. The president also has decided to renegotiate bilateral investment treaties with a number of countries, including Singapore, the largest investor in Indonesia last year. He has enthusiastically endorsed the idea of several massive, state-run manufacturing projects, like building a “national car” such as Malaysia’s national car Proton. But there is little evidence that a national car project can eventually be profitable; despite huge state subsidies, Proton has repeatedly struggled to make money. Meanwhile, the Jokowi administration has not substantially liberalized the Negative Investment List, the list of sectors in Indonesia in which foreign investors are banned or have their investments sharply limited. Yet at the same time, Jokowi has used several high-profile speeches, such as his speech to the APEC CEO summit last autumn, to tout his idea of Indonesia as a place with less red tape—that the time to invest in Indonesia is now. 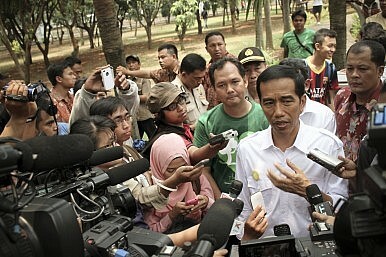 “We are waiting for you to come to Indonesia,” Jokowi told a group of potential investors. In his first year in office, Jokowi may be simply feeling his way on economic policy, as well as trying to navigate a legislature where his party is not dominant and where PDI-P contains factions that do not always get along. Jokowi is also a natural politician who understands that a strain of nationalist, protectionist discourse has always existed in Indonesian society, and that this strain remains strong today. However, Indonesia cannot upgrade its infrastructure, position itself as a shipping hub, produce reliable electricity, or add value to its manufacturing industries without substantial investment, both from large domestic companies and from foreign firms.